(a) Using SST, remove the bolt and RH timing pulley. (b) Using SST, remove the bolt and LH timing pulley. HINT: Arrange the camshaft timing pulleys (RH and LH sides) so that they can be returned to their original locations when reassembled. (a) Disconnect the 3 engine wire harness clamps from the timing belt No. 3 cover. (b) Remove the 6 bolts and the timing belt cover. NOTICE: Since the thrust clearance of the camshaft is small, the camshaft must be kept level while it is being removed. If the camshaft is not kept level, damage to the cylinder head or to the camshaft may result. To avoid this, the following steps must be carried out. (a) Align the camshaft drive and driven gear's timing marks (2 dot marks each) by turning the camshaft with a wrench. (b) Secure the exhaust camshaft sub gear to the main gear with a service bolt. HINT: When removing the camshaft, make certain that the torsional spring force of the sub gear has been eliminated by installation of the service bolt. (c) Uniformly loosen and remove the 10 bearing cap bolts in the sequence shown in the illustration. Remove the 5 bearing caps and the camshaft. Do not pry out the camshaft. Be careful not to damage the portion of the cylinder head receiving the shaft thrust. (a) Uniformly loosen and remove the 10 bearing cap bolts in the sequence shown in the illustration. Remove the 5 bearing caps and the No. 2 camshaft. (b) Remove the oil seal from the No. 2 camshaft. NOTICE: Do not remove or install the camshaft timing gear (VVT-i) unless you are replacing the VVT-i or the camshaft. (a) Clamp the camshaft in a vise on the hexagonal lobe. NOTICE: Do not damage the camshaft. (b) Using a 46 mm socket wrench, remove the lock nut by turning it clockwise. Remove the lock nut with the lock-pin engaged and locked at the extreme retarded angle position. The lock nut has LH threads. Only use the socket wrench. Other tools will deform the cam angle rotor. (c) Remove the timing gear (VVT-i). NOTICE: Never remove the 3 bolts on the gear. If it is difficult to remove the VVT-i, tap it lightly using a plasticfaced hammer and then remove it. (b) Using SST, turn the sub gear counterclockwise, and remove the service bolt. (c) Using snap ring pliers, remove the snap ring. (d) Remove the wave washer, camshaft sub gear and camshaft gear spring. (b) Install the camshaft gear bolt washer and the camshaft sub gear. HINT: Attach the pins on the gears to the gear spring ends. (c) Install the wave washer. (d) Using snap ring pliers, install the snap ring. (e) Using SST, align the holes of the camshaft main gear and sub gear by turning the camshaft sub gear counterclockwise, and temporarily install a service bolt. SST 09960-10010 (09962-01000, 09963-00500) (f) Align the gear teeth of the main gear and sub gear, and tighten the service bolt. (a) Align the alignment pin with the alignment pin groove and install the VVT-i on the camshaft. NOTICE: Install the VVT-i with the lock-pin engaged and locked at the most retarded angle position. (b) Apply engine oil to the nut, the mounting surface of the VVT-i and the screw threads. Be sure to apply the oil, otherwise the specified torque cannot be obtained. A new nut must be used when replacing the VVT-i unit. (c) Using a 46 mm socket wrench, install and tighten the lock nut by turning it counterclockwise. NOTICE: Since the thrust clearance of the camshaft is small, the camshaft must be held level while it is being installed. If the camshaft is not level, the portion of the cylinder head receiving the shaft thrust may crack or be damaged, causing the camshaft to seize or break. To avoid this, the following steps must be carried out. (a) Apply new engine oil to the thrust portion and journal of the camshaft. (b) Place the No. 2 camshaft at a 90 angle of the timing mark (2 dot marks) on the cylinder head. (c) Apply MP grease to a new oil seal lip. (d) Install the oil seal to the camshaft. Do not turn over the oil seal lip. Insert the oil seal until it stops. (e) Remove any old packing material from the contact surface. (f) Apply seal packing to the No. 1 bearing cap, as shown in the illustration. Install the No. 1 bearing cap within 5 minutes after applying seal packing. (g) Install the 5 bearing caps in their proper locations. (h) Apply a light coat of engine oil on the threads of the bearing cap bolts. (i) Uniformly tighten the 10 bearing cap bolts in the sequence shown in the illustration. (b) Align the camshaft drive and driven gear's timing marks (2 dot marks each). (c) Place the camshaft on the cylinder head. (d) Install the 5 bearing caps in their proper locations. (e) Apply a light coat of engine oil to the threads of the bearing cap bolts. (f) Uniformly tighten the 10 bearing cap bolts in the sequence shown in the illustration. Torque: 16 NVm (163 kgfVcm, 12 ftVlbf) (g) Remove the service bolt. (a) Visually check for cracks and breaks in the gasket of the timing belt cover. HINT: If water is entering through cracks or breaks in the gasket, repair according to these guidelines: 1) if the crack length is within 2 to 3 cm (0.79 to 1.18 in. ), repair with seal packing; or 2) if the crack length is over 3 cm (1.18 in. ), replace the gasket. (b) When repairing the timing belt cover gasket, follow the procedure below. Repair the cracks and breaks by applying the seal packing to the damaged area. NOTICE: When applying the seal packing, apply it as wide and high as the gasket. (c) If the timing belt cover gasket needs to be replaced, follow the procedure below. Using a screwdriver and gasket scraper, remove the remaining gasket. NOTICE: Be careful not to damage the timing belt cover. 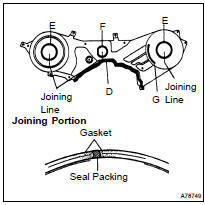 Remove the backing paper from a new gasket, and affix the gasket along the groove of the timing belt cover, as shown in the illustration. Affix the gasket in the center of the groove. At the corners, try to keep the gasket thickness uniform. If there is a gap on the joint of the gasket, apply seal packing to close the gap. (d) Install the timing belt cover with the 6 bolts. (a) Install the camshaft timing pulley with the belt guide properly oriented and tighten the bolt temporarily. Face the belt guide of the RH timing pulley towards the front of the engine. Face the belt guide of the LH timing pulley towards the rear of the engine. (b) Using SST, tighten the RH pulley bolt. (c) Using SST, tighten the LH pulley bolt.